This is a great pattern to use when fly fishing for Smallmouth Bass. When the little frogs known as spring peepers come out to play, so do the smallies. Here in Asheville, NC this pattern has produced for us time and time again on our freestone rivers the Nolichucky River & French Broad River. Our first 100 trips in 2019 will receive free AFFC stainless steel water bottles to take home. Fly Fishing the Watauga River for wild Trophy Brown Trout during Black Caddis Hatch. The video we did last year "A trip into the wild", which features Smallmouth Bass Fly Fishing, Overnight Trips with Safari Camp and Whitewater option, has recently been featured by R.L. Winston Rod Co., Dun Magazine, the Angler Report and Moldychum.com. Check it out! Special thanks to producer Josh Branstetter and all those involved! If you are interested in this experience, we are now booking mid-June through mid-October 2018. You can read more info on this experience by clicking here. These trips are not geared toward whitewater like a whitewater rafting trip. aggressive Smallmouth Bass that live within. Trips are full day floats with a two boat minimum. Multi-day trips with Safari Camp are available. ACA Level 4 Swiftwater Rescue certified and fully insured. 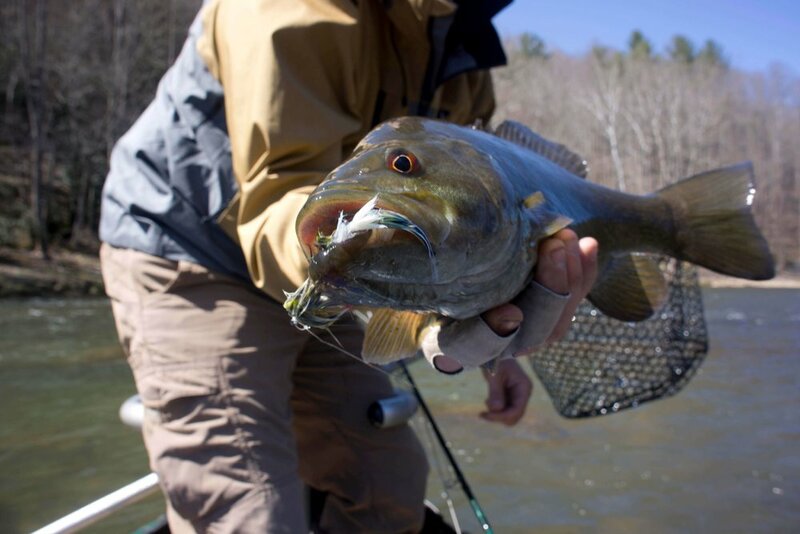 Smallmouth Bass fishing in the Southern Appalachian Mountains is renowned as some of the best on the continent. We target these fish on our float trips on the fly and with tackle. If you enjoy a tenacious pull from the surface and seeing acrobatic fish dance, then this is for you. We target several rivers located in Western North Carolina and East Tennessee. Click here for more information. 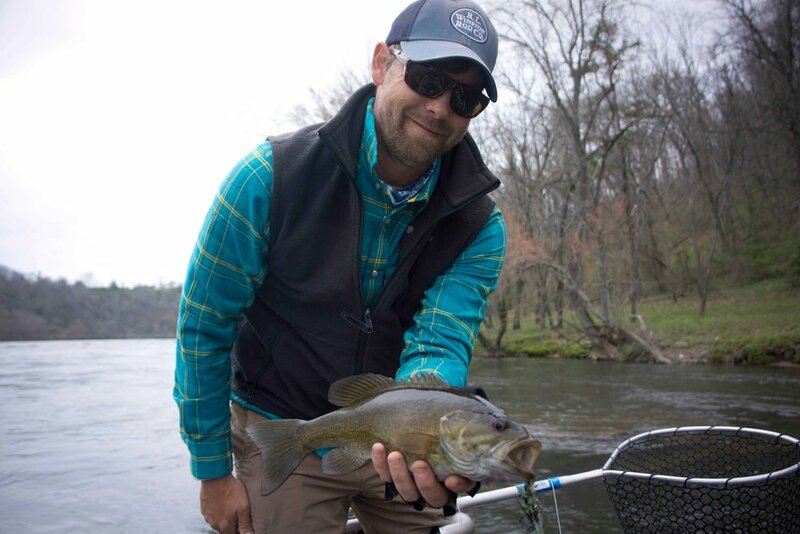 For the adventurous angler looking for a remote experience, Asheville Fly Fishing Company is the only guide service in the Asheville area offering a smallmouth bass fishing trip on Class III-IV whitewater. While it is becoming rare to find a true remote wilderness experience in the east, we are fortunate to have access to the French Broad River section 9 and the Nolichucky Gorge. These trips offer excellent Smallmouth Bass fishing and flow through two of the most remote, beautiful sections of river found in the eastern US. All guides are ACA Level IV Swift Water Rescue and CPR/First Aid certified and fully insured. Click here for more info. So much water, so little time. If you need more than one day of fishing, we understand all too well. We offer multi-day trips with Safari style camping. Click here for more info and watch the video below. At Asheville Fly Fishing Company, we value long-lasting relationships with our guests and enjoy sharing memorable days on the water. Click here to read what people are saying about their experience with us. Guiding is our passion. Sure we love catching fish on our days off, but sharing the experience is far more rewarding. We are problem solvers who enjoy the connections and process just as much as the pull. We push each other to be innovative, aware of the fine details and to always anticipate the next move gracefully and with respect. Our goal is to give you the best service you have ever experienced, and to always enjoy as much river experience as possible while putting fish in the net. Our first time out with you, we are taking notes on the details that make a difference to you. From the moment we meet you onward, we go the extra miles so you are right where you want to be, fishing better and laughing louder. Click here to read more about the guides. With several good snows under our belt the ground water table is up as we move into the rainy season. 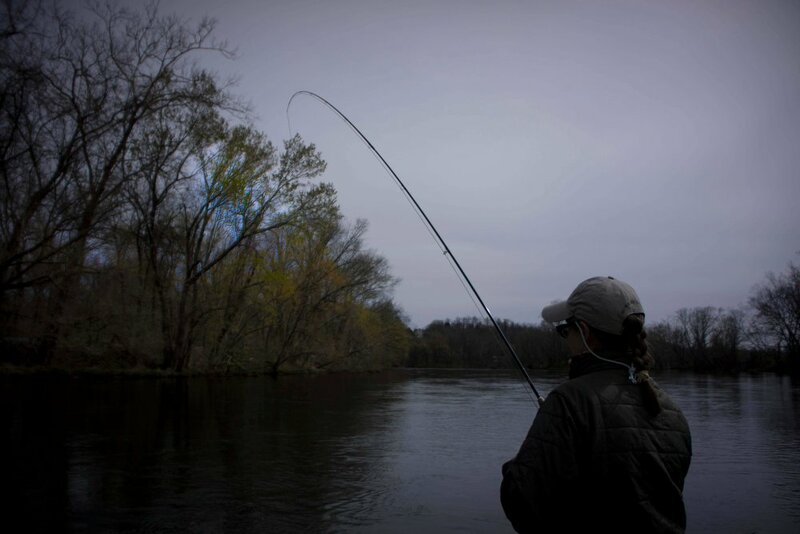 We anticipate good water levels for spring fishing on our freestone rivers. This week we are getting our first taste of warmer temperatures and perhaps the beginning of the warming trends that will take us into spring. As this trend progresses, we recommend your fishing efforts be spent during the end of each warm spell. Don't go the first day it warms up. If you've got five days of warmer temps in the forecast, hit the water on day 3, 4 or 5. This will give the water temperature a chance to increase resulting in more active fish and more fish in the net. Gift Certificates are available for your fishy friends & loved ones. Summertime is officially here in Asheville, NC! Water levels are above average and conditions are great for fishing and enjoying the outdoors. We've noticed the fishing has been better than the previous two years and we anticipate the trend will continue. Here's a few highlights of what you can find on the water in the Asheville area. Water temps are just now getting above 70 degrees with average to above average water levels compared to the 100yr. average. While spring has been hit or miss due to rainfall and blown out rivers, the fishing has been very good this year. Those windows of time when the river clears just enough before the next rain are gold. The fish know the rain is coming and they must feed while the livin' is easy. As summer continues and temperatures rise, fishing will start to slow down mid-day. Please consider practicing catch and release and keeping the fish wet. An 18" Smallmouth Bass takes 8-10yrs. to get that big. The top water bite is hot and fish are exploding on frog patterns and boogle bugs. Enjoy! Sulfurs are hatching on the both the South Holston River & Watauga River, offering great dry fly fishing. Any time now the Japanese Beetles will start falling out of the trees. The Brown Trout will be there waiting and so will we. This event is a blast and offers both beginners and experts the opportunity to sight fish. These rivers fish well year round and boast a dense population of wild Brown Trout. Both rivers are most effectively fished from a driftboat as water levels change daily. Please use caution if you plan on wading and make sure you know the generation schedule. WNC Delayed Harvest waters have opened as of June 3rd, so wade fishing just got a whole lot tougher. During summer months we recommend floating but if you prefer wading, we recommend going for wild trout in the higher elevation streams. This will take you away from the crowds and into to the wilderness where native Brook Trout aggressively rise to dry flies. Safety First! AFFC guides are certified to the highest level. You can rest assured that you will be in safe hands with Asheville Fly Fishing Company. Our team has the highest level of Swift Water Rescue and River Rescuecertification in addition to the minimum required CPR / First Aid certification. Swimming in 40-50 degree water for extended periods. Flipped, wrapped and pinned boat rescue. 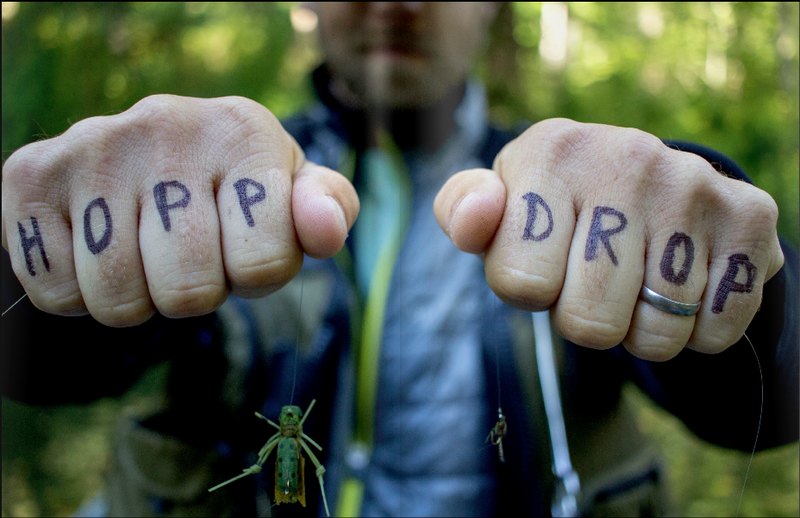 Thanks to Fin & Field for adding us to Papa-Would-Be-Proud Adventure Series featured on Field and Stream. Featured in Dun Magazine "Page 5 Guide"
A big fishy thanks to the fine folks at Dun Magazine. We love them and Dun magazine. The magazine is available online and in print for your enjoyment. It was fun answering their questions and that is what its all about! Thanks for keeping it fun! Check out the feature and this great fishing magazine by clicking the following link. While your recovering from a food coma in your favorite chair this holiday, take a minute to check out the most recent issue of Southern Culture on the Fly. We had the pleasure of rowing the SCOF crew down the Natahala Gorge on a day off from guiding. We were in aluminum Drift Boats hunting for wild brown trout. A big thank you to the guys at Southern Culture on the Fly for a great experience. It is always a pleasure with SCOF and we love their magazine. Thank you to Asheville Fly Fishing Company's guides Zach Bassett and Anthony Esposito for their great work behind the oars and great attitudes. July was a good month. It was a hot, busy month on the water. While below average water levels and above average temperatures have made the Smallmouth Bass fishing challenging, the tailwaters in East Tennessee have been fishing great! Since the South Holston River and Watauga River are tailwaters (Rivers fed by a dam where the water comes from the bottom of the lake), they stay cold enough and flow enough for the fish to remain happy. We've been experiencing some extra happy fish this summer with the abundance of Japanese Beetles falling out of the trees. Both brown and rainbow trout are looking for them actively and the Big Brown Trout are on the prowl. The Beetles have been on for two or three weeks and we anticipate they will continue through August. If you want in on the action, give us a call! We still have a little availability in August, so book sooner than later! I touched down in Toronto just past mid-night on June 18th. Coincidentally this date has a lot of meaning for me, but for this post the most important fact to keep in mind is that June 18 is the opening day for smallies in Ontario, something we don't appreciate here in the south. The plan was set a year before. Ben, a buddy that I had originally met on a flight to Portugal a few years ago, picked my girlfriend and I up at the airport. Once through customs we walked out the doors and immediately saw Ben waiting. Hugs and back slaps were exchanged and then we were off. After a non-stop 4 hour drive we arrived at our destination- a tiny, glacial lake 20 miles from the St Lawrence Seaway that Ben's family had a cottage on and that had no public access. It was 4:15 and the sky was just turning grey. Rod, reel, and fly box had been stashed strategically on top of the food rations in the back of the car for easy retrieval, and withing 10 minutes of pulling into the drive we were in the Lund, cutting through the morning air with me standing at the bow, 8 wt in hand, fly line lying at my feet, a freshly tied yellow popping bug on the leader, and the unforgettable feeling you have just before doing something you'd been envisioning and anticipating for a long time. The outboard was silenced and the boat went into a quiet glide. Before Ben even had time to point out a rocky reef I threw my first cast. One pop. Two pops. Pause. Rod tip just over the water. Boom. Big eat and even bigger fish. That first fish of the trip came just as the warm colors of morning bled across the horizon. There were countless fish caught on that trip, but that first fish, and that first morning in Canada, blending with all of the emotions of the past year and a half, was one of the most powerful moments of my life. I said a silent "thank you" to no one in particular, and for a few moments, even with my hands still wet and fishy, forgot about the fishing. I took in the lake and the light, looked at my buddy, and smiled. He knowingly smiled back, and without a word and with eye brows raised, pointed to a rise ring behind me. Tagged: Smallmouth Bass Asheville, smallmouth bass on the fly, Smallmouth Bass, Asheville Fly Fishing, Fly Fishing Asheville, Fly Fishing Guides, Fly Fishing the South, fly fishing gifts, Guided Fly Fishing Trips, Southeast Fly Fishing, Southern Appalachian Mountains, Asheville Fly Fishing Company, Asheville Fly Fishing Co.
We've been busy guiding and making memories on the rivers of East Tennessee and Western North Carolina. Spring fishing has been great so far and its just getting started. Thanks to all our recent guests for making our jobs fun! Here's a few pictures from this weeks guided trips. The South Holston River has gained a reputation for being among the best Wild Brown Trout fisheries in the Southeast United States. With an average of 8,000 trout per mile, 20 miles of fishable water sustaining 85% wild browns, we can attest to its greatness. Being a Tailwater, where the water level is controlled by a dam, it is a year round fishery offering world class fly fishing with various opportunities. It's limestone riverbed and consistent water temperature provide excellent conditions for trout to thrive. 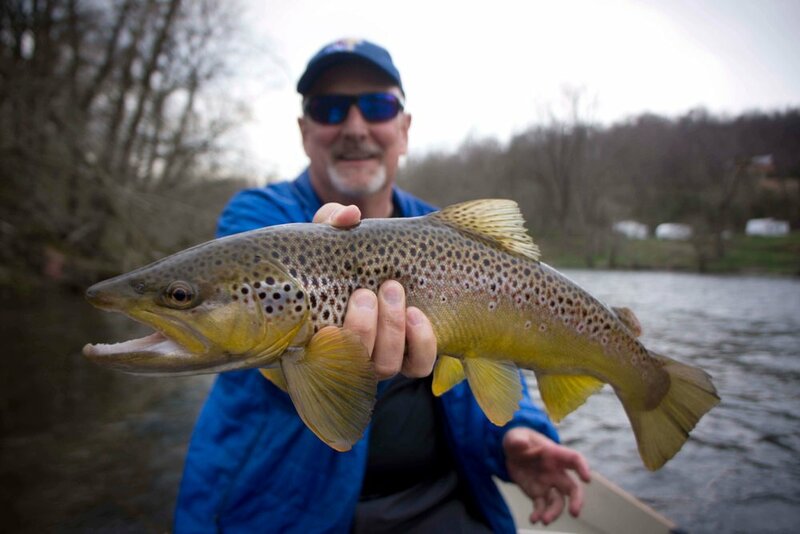 The “Soho” is no doubt a “Brown Trout Factory.” We would love the opportunity to guide you to a great experience on the South Holston River! In addition, use streamers in darker colors in the winter and early months of the year and as the water warms graduate to the lighter-colors. Use florescent and bright colors in muddy and dingy water, and lighter colors in clear and warmer waters. With all the snowmelt, rain and demand for electricity, the Dam generators have been running 24/7. During these periods, the fish acclimate to high water holding spots and the bigger Wild Brown Trout come out to play. On high pressure days with abundant sun, nymphs, midges and soft hackles are getting the job done. As Spring and warmer temperatures approach, dry fly fishing will get better. Until then, warmer days reaching 60+ degrees will produce some great Blue Winged Olive hatches and rising fish. Because the South Holston River’s levels fluctuate depending on generation, we recommend two days on this river to get the best conditions and maximize your experience. We offer all inclusive guided fishing trips and various lodging options to accommodate you best. We look forward to getting on the water with you! Give the gift of Fly Fishing this holiday season by purchasing a Gift Certificate for a friend or family member. We'll send you a physical Gift Certificate that can be applied to a Guided Fly Fishing Trip of their choice. Expiration dates are 1 year from purchase date, so they'll have plenty of time to schedule a trip at their convenience. Happy Holidays from all of us at AFFC! We look forward to getting on the water with you. S.C.O.F (Southern Culture On the Fly) is an online fishing magazine filled with informative articles, fishy humor and vivid photography. So when they told us they wanted to do a an overnight trip for Smallmouth Bass on the Nolichucky Gorge and feature the story in S.C.O.F's Fall 2015 issue, the perma-grin set in. Three rescheduled dates and seven months later, we were packing the boats and checking water levels. 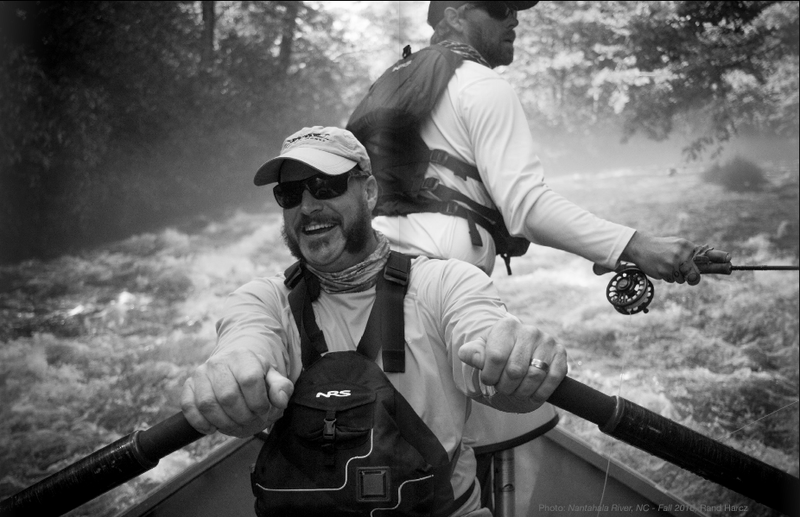 For good fishing and easier rowing, we typically run the gorge between 700cfs and 1600cfs. The water level was a boat-dragging 350cfs the morning of the trip. This is an extremely low level, making it hard to navigate anything bigger than a kayak. At this level, the rapids grow teeth, the slots become cracks, broken oars are common and dragging the raft is sure to occur at least once. We were running rafts with fishing frames and oar rigs. Each boat carried one angler, one oarsman/guide, fishing/camping/camera gear and a cooler. Three rafts, eighteen rods and reels, enough food and flies for six adventurists and every smallmouth bass in the gorge, we headed north from Asheville to bring it all down 9 miles of class III-IV water 2,500ft down in the Nolichucky Gorge. The "Noli" gorge is sacred to many, loved by more. If you go, please treat it with respect, play safe, and practice catch and release so that others may enjoy its splendor. Since the article came out, we have received several inquiries about fly patterns and the smallmouth in the Western North Carolina and East Tennessee mountains. If you have questions or are looking for info, contact us anytime! Happy 4th of July! We are looking forward to watermelon, fireworks, homemade peach ice cream and good days on the water. Hope everyone has a great holiday weekend!